Most old Grammar Schools were attached to the parish church and founded by a generous benefactor, such as the Grammar School at Mottram which was founded by Edmund Shaa. Ashton-under-Lyne had had a grammar school of sorts attached to the parish church, roughly where the car park is on Church Street, but this was already in disuse when Edwin Butterworth wrote in 1842. "a school house was erected in the seventeenth century on land given by the manorial owners adjacent to the church-yard for the education of the children of the parishioners generally, the means of its support have been generally derived from the parents of the scholars"
However, Ashton-under-Lyne Grammar School has its roots in the nonconformist Independant Congregational school at Albion. Albion School was completed in 1862, and opened on Good Friday of the same year. The eventual cost was �,000, and at the time it was the largest Sunday School in England. The building included an assembly room that could seat 1,000 people, a lecture theatre, an infants' room and eleven classrooms. It opened as a day school in 1869 and celebrated it's jubilee in 1912. The famous day school closed in 1926 and the pupils transferred to the new council school on Mossley Road.. The building still stands in Ashton-under-Lyne, although it is now an office furniture warehouse. Titus Tetlow Esq of Ashton-under-Lyne left a sum of money in his will (June 26th 1890) to promote the education of both sexes and money for the trustees to devote money for prizes and for the salaries of Science and Art teachers at the Mechanics Institute. Technical Schools and Colleges emerged from the Mechanics Institutes. George Hegginbottom another Albion man and millowner amongst his many instances of goodwill left the sum of �,000 in his Will to the Corporation. The money was used to erect a "Free Library and Technical Institute" on Old Street. The Hegginbottom Technical School opened in 1892. One of the first in the Country and one of the most important in Lancashire, bringing Ashton to the forefront of Techincal Education in the Country. The "Hegginbottom Scholarship" was founded to promote the study of Art and Science and the School of Art was housed in the same building. The 1903 Education Act paved the way for the formation of Secondary Schools. In October 1904 Ashton-under-Lyne Secondary School was formed from the School of Science in the Hegginbottom Technical School. Every year places were awarded to 32 pupils, 16 for girls and 16 for boys. Only 16 of the places were for Ashton boys and Girls and each year 500 boys would sit an entrance exam for the 8 available places. 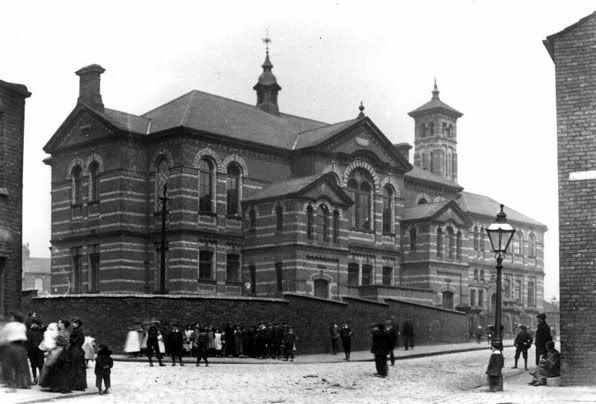 Although formed from Congregational roots, Ashton Secondary School was the first in the district where parents of any religious doctrine could send their children free from sectarian doctrinal influence. When in 1928 this school obtained its own building on Darnton Road, it acquired the name of Ashton-under-Lyne Grammar School. The school was co-educational from day one. In 1980 under educational reorganisation high schools for 11-16 years olds were created and Ashton Grammar became a Sixth Form College under local authority control. The 1992 Further and Higher Education Act allowed colleges to become independent and Ashton Sixth Form became independent on the 1st April 1993.